SCP-267, a subspecies of Heterocephalus glaber (naked mole rat). Pictured is a gestating breeder with nursery attendants. Special Containment Procedures: SCP-267 is contained in a cave formation within Site-37. Live animals must be supplied to replace any that succumb during the course of feeding. A population of livestock is maintained on site for this purpose. Any personnel interacting with SCP-267 organisms should be furnished with level 4 isolation equipment, and a tranquilizer weapon and stun gun for protection. Wild occurrences of SCP-267 must be eradicated as soon as they are detected. Recovered human victims cannot be rehabilitated, but are to be removed for use in ongoing observation of possible anti-senescent effects of SCP-267's venomous excretions. Description: SCP-267 are hairless, sightless, carnivorous rodents highly adapted for subterranean life in eusocial colonies. A single nest is currently contained in the ███████████ cave formations in █████████, █████████. SCP-267 is biologically similar to Heterocephalus glaber, but represents a distinct subspecies. Members of an SCP-267 colony spend the vast majority of their lives underground. They lack eyes completely, and auditory and tactile senses are atrophied. They do not seem to experience pain or any sense of self-preservation. They are extremely sensitive to smell and airborne chemical stimuli, which they use for navigation, hunting, and communication. Unlike in eusocial arthropods, there is no queen. There are caste divisions in its population, however, including workers, soldiers, breeders, and nursery attendants. SCP-267 has sharp teeth and claws, but its primary weapon is its venom. The venom is effective in µL amounts and has aggressive paralytic and carcinogenic effects. In a hunt, dozens of soldiers cooperate to locate and bring down prey. They attack simultaneously, inflicting dozens of bites in a few seconds and incapacitating the target. They then drag it, conscious but immobile, back to their colony. At the colony, swarms of worker caste SCP-267 emerge to transport the victim inside. Workers remove foreign aromas, carefully check for parasites, and physically dismantle the organism's means of locomotion to prevent escape. By this time, tissues directly exposed to venom have begun to exhibit abnormal cell division. Within 24 hours, undifferentiated masses of tissue are visible at every bite location. The tumors arise spontaneously but seem to target skin and fatty tissues, as growths they are less likely to threaten vital organ systems. This has the added benefit to SCP-267 of producing a high concentration of energy-rich lipids for consumption. The tumors grow continuously until a few days after the larder animal's death. Because of the rapid tumorigenesis, larders have massive caloric needs. Workers masticate and regurgitate root pulp to provide the larders with nutrition. They seem to distinguish cancerous from healthy tissue by its scent, and remove tumors for consumption once they have "ripened" to a desirable size. Workers have been observed licking and tending to larder animals to keep them clean and healthy. Larder animals last between 12 weeks and ██ years, depending on the species, and supply all of the colony’s food. Many months typically elapse between SCP-267’s forays to the surface. Members of SCP-267 are violently territorial and respond with overwhelming force to any intrusion into their caves. With sufficient food they are capable of extremely rapid reproduction, a fact that has become particularly threatening since the extinction of their primary predator, ███████████████████. Addendum 267-1: Bones from human beings have been uncovered in multiple waste areas within the caves, dating back several thousand years. Because of the difficulties in operating inside the nest, a full forensic survey of these leavings is unfeasible. Nineteen months after containment was first established, larder A-26 was discovered to be human, possibly █████████████, who disappeared along with his parents on a family trip in 19██, at the age of █. The lack of appendages combined with rampant tumor growth is responsible for delaying the initial identification. Genetic tests are consistent with human DNA with massive deleterious mutations. Attempted interviews with the subject (SCP-267-A26) have discovered only that his language faculties have atrophied over the course of his imprisonment. Addendum 267-2: SCP-267 shows a marked preference for acquiring humans as compared to other mammals. This is likely a result of humans' long life span and fast metabolism compared to other prey. 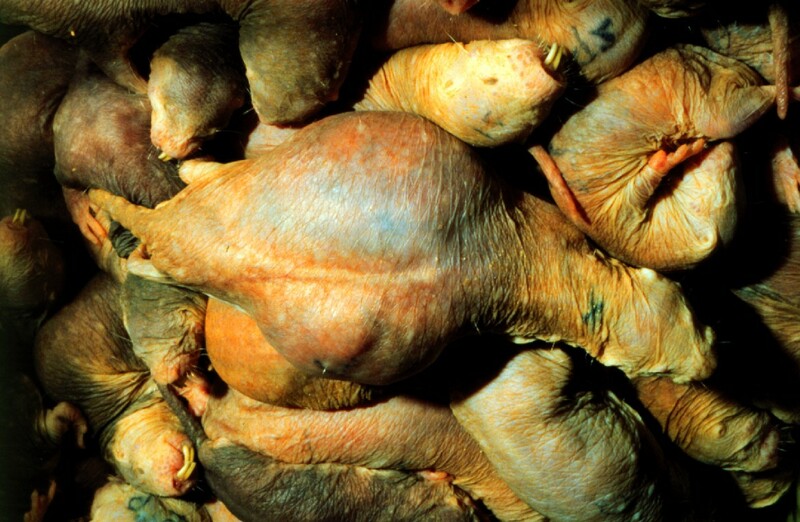 Human subjects provide 33% more cancerous matter per month than a similarly sized pig, and can be kept as larder animals until the expiration of their natural lifespan.1 This helps to explain forensic and anthropological evidence of human predation even at a time before habitat intrusion made such behavior inevitable. 1. There is some evidence that animals (including humans) may live longer than normal individuals of their species, perhaps due to some effect of SCP-267's venom or due to abnormal tumor growth. Further observation is necessary to substantiate this observation.